Chassis Line can supply heavy haulage equipment for all purposes. Equipment is designed on Solidworks allowing Chassis Line to custom build to all customer requirements, to give you the best result in practical and engineering terms. We also ensure that your custom-built vehicle will conform to the necessary Road Transport Authority specifications. 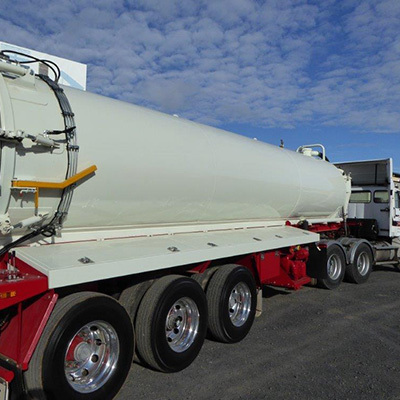 Our main products are vacuum tankers, quad dog trailers, road train dollies, crane dollies, rockover trailers and skels. 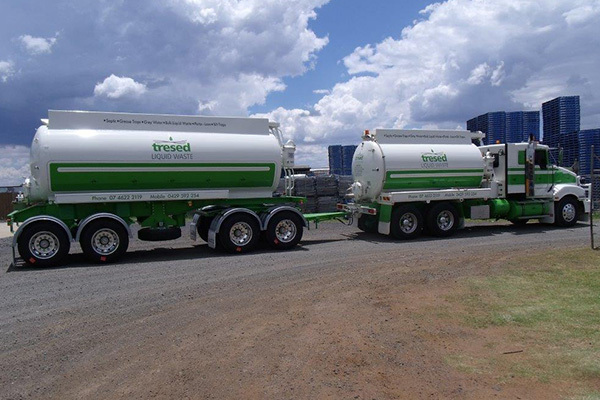 Hydrovac Equipment Chassis Line Toowoomba produces tri-axle vacuum tank trailers and to date we have over 50 trailers with a 25000 litre capacity servicing the oil & gas industry. We started out with one customer who sourced his own tank that we fitted to our custom built chassis. However after experiencing difficulties & unreliable after-sales warranty issues on the tanks we then designed and developed our own vacuum tank. Our certified vacuum tank has been designed to eliminate the need for external rings to give you the advantage of a reduced tare weight & unobstructed surface to assist with reduced cleaning time. 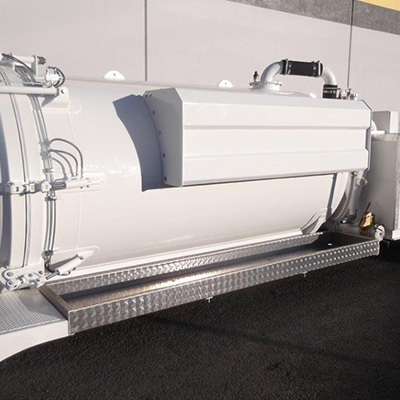 Our vacuum tank units have stood the test of the harsh conditions associated with the western development of the gas exploration that imported units have simply failed to withstand. Vane pumps were used on our initial builds. We then trialled Jurop blowers as an alternative with great success. On numerous occasions our Jurop powered vacuum tanks have been used in a 24 hour situation where it was used as a pump station for other units to great success. We have built numerous vacuum truck & quad dog combinations that are straight-up vacuum units with the quad dog generally as the slave unit to save on build costs. We have also successfully designed hook lift skid-based hydro excavation vacuum units for the ever changing conditions at Weipa & its coastal tracks. All our vacuum tanks are hydrostatic tested & by using our Solidworks drawing program we ensure you achieve the best design that suits your truck axle mass limits before production even starts. All our vacuum tanks are sandblasted & painted internally & comply with all the applicable ADRs. 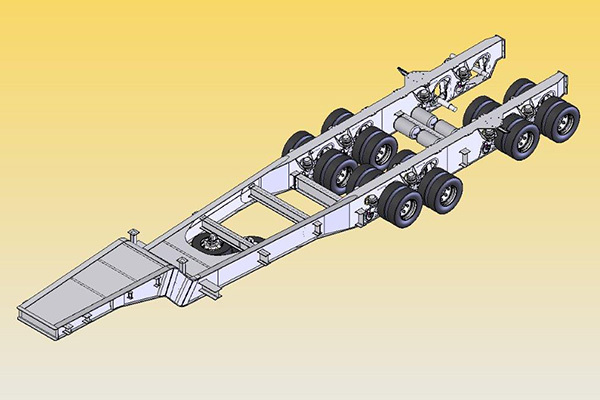 Chassis Line has built a vast range of dollies & our flexible drafting & design service guarantees you get the model that suits your trailer design or specific concept requirements. 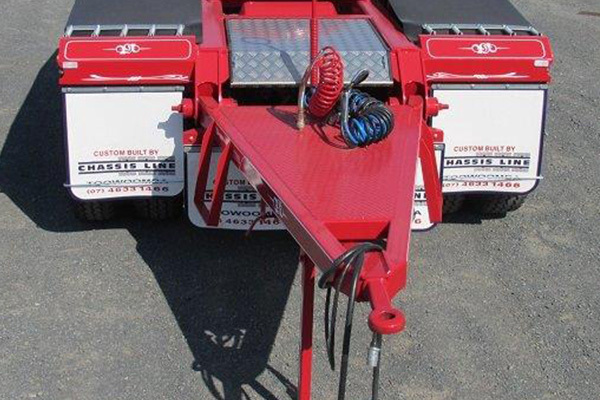 Roadtrain Dollies are available as tandems or triaxles, incorporating TMC Suspension and axles. Chassis Line has produced over 30 crane dollies & our designs are custom built to suit each individual crane. The most common design is using a low mount boom support, we also offer a trolley design & also a hydraulic cylinder with an accumulator to protect the crane boom. 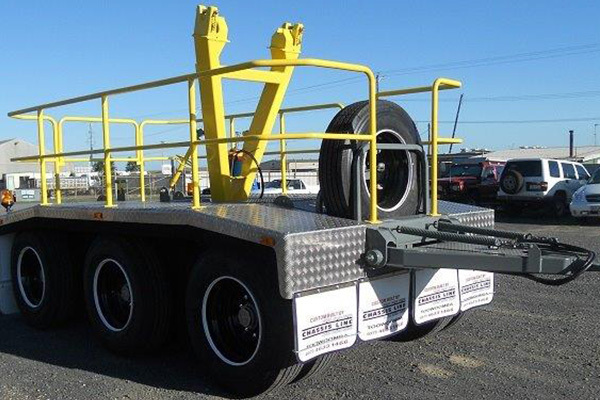 Our Crane Dollies, Rockover Trailers and Skels are built to customer specifications. Major projects completed in the past include mast dollies for 200 tonne cranes. Chassis Line has qualified engineers to assist you with all your drawing or design concepts. We are happy to draw & design to your specific requirements & produce for you a full set of drawings to enable you to build your own concept or arrange for the different manufacturing industries to tender on the separate parts of your project. Services offered also include the compliance & certification of vehicle modifications. Chassis Line incorporates all the improvements that over 30 years’ experience brings in their trailer designs guaranteeing you achieve the maximum return on your investment. Utilise quality TMC axles and suspension and a BPW ballrace.